I haven’t featured a tram system on The Beauty of Transport so far. There’s a simple reason for that. Most of them are plug ugly. I have no idea why that should be the case. Modern tram systems are often an expression of civic pride as well as serving a transport need. As you’ll know if (a) you’ve ever watched the episode of The Simpsons, “Marge vs. the Monorail”, or (b) you’ve had a trip on Birmingham’s Midland Metro system, sometimes fixed-infrastructure urban transit systems actually have very little to do with transport requirements, and virtually everything to do with civic pride. So why they should so often be so ugly is a source of constant bemusement to me. Tram stops are usually like grandiose bus stops. And while bus stops can be beautiful, tram stops very rarely are. Modern trams themselves (although I try to keep away from vehicle styling on this blog) often tend towards the egg-boxy. As one of my ex-editors described the original batch of Croydon Tramlink trams (they run on a network in the southern part of Greater London if you’re an overseas reader), “they look like something from the Soviet Bloc.” I took the point. Britain’s pioneering modern tram system is Manchester Metrolink, and its first batch of trams were absolute shockers, capable of cracking a mirror from some distance away, just by being reflected in one. Incredibly the second batch, requiring more substantial pedestrian guards around the couplers, looked even worse. Meanwhile, tram infrastructure is often, erm, functional and little else. Again on Croydon Tramlink, the overhead wires are held up by massive H-frame girders in many places on the street-running sections. I once heard from someone who had done some of the design work on Croydon Tramlink that the overhead wire supports were specified to resist a potential nuclear attack on London. This was alleged to be thanks to a bizarre requirement from the planning authority which overlooked the fact that in the event of nuclear attack, travelling on Croydon Tramlink would be the last thing on any south Londoner’s mind. And that the overhead line itself would probably have melted. So this story might actually be wildly fanciful (although I do love it) and the real reason could well have been as simple as money. Anyway…it’s actually quite difficult to find beauty on tram systems. Montpellier, France, has slightly spoiled this argument by going completely bonkers for outré styling, as only the French can when they get it into their heads to go all fashion-week. And to do it, they recruited internationally famous fashion designer Christian Lacroix. But more of that another time. Instead, this time, I’d like to nominate one of the few tram stops that have enhanced their urban environment, rather than just being plonked there. It’s Strasbourg’s Homme de Fer (which does indeed translate as Iron Man but which I’m pretty sure is nothing to do with Robert Downey Jr.), at the heart of that city’s tram network. Here it is. It’s a large, circular green glass structure, 35m across, which dominates the square on which it is located. And it makes you stop, and look, and think “wow” and realise that your day has been made slightly better for seeing it. Doughnut shaped in plan, with an open centre, it slightly recalls Guimard’s glazed canopies around the larger Métropolitain station entrances in Paris. Greater minds than mine, in this case America’s University of Washington, describe it as helping “lower the scale of the square, acting as a canopy amidst the surrounding six-story buildings,” (there’s a useful paper I’ve lifted some of the facts and figures from, here). Designed in 1994, the architect of Homme de Fer was Guy Clapot (1955-2010) about whom I knew absolutely nothing before I started this entry. As I’ve mentioned before, I find out all sorts of stuff writing this blog. Information on him seems scarce, so I’m leaning a bit on Wikipedia France here, but he taught at the School of Architecture in Strasbourg while Homme de Fer was built, so he was an architect who was prepared to live with what he built. He was also an urban planner, so was interested in public spaces rather than solely buildings; he also redesigned Strasbourg’s main square Place Kléber. 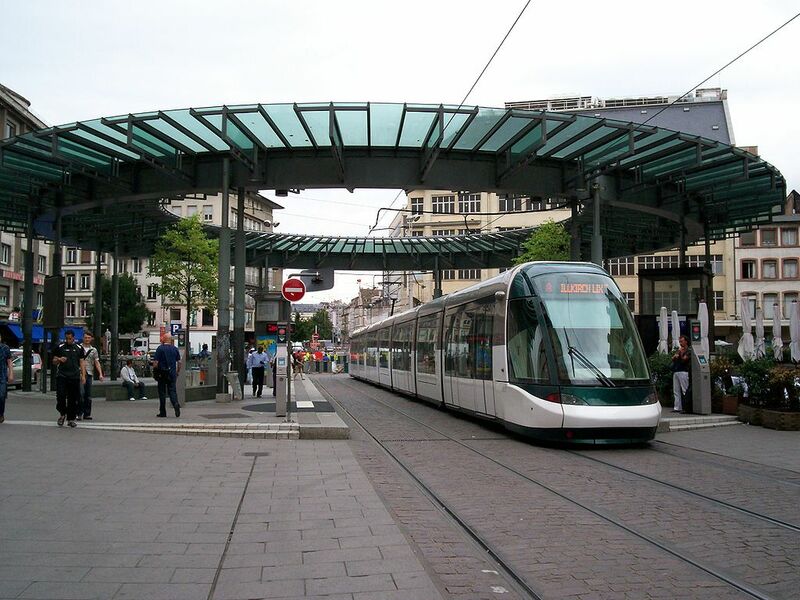 Strasbourg is doubly lucky because as well as having an attractive tram stop at the centre of its network, its trams are reasonably pretty too. How the city pulled this off when so many others didn’t remains, for now, a mystery. Clapot doesn’t seem to have had much other impact on transport, but for bringing the world an attractive tram stop, when so many other tram systems have singularly failed to do so, he deserves some recognition, I think.